Unbelievably hot springtime weather brought hordes of San Franciscans out to the westernmost part of the City this weekend. 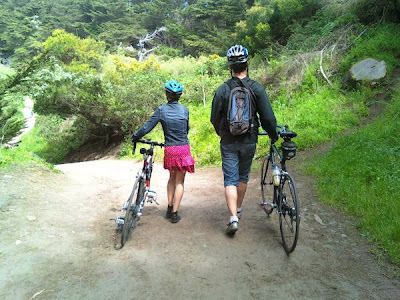 I spent the majority of the day at Lands End with some friends visiting the labyrinth, where we crossed this couple on their bicycles. Cool (or better said try to stay cool - one more hot day...) thanks for the info on the Labyrinth. I had never heard of that, but then again there is so much in SF and the area to be discovered even after all these years. BTW Hows the heat treating your bike commute? I was ill prepared to day and wore my suit jacket and nearly collapsed mid ride from the heat. The labyrinth is way cool. You should definitely spend some time out there. Right next to Mile Rock Beach.